Standing to approved females, 4X Grand Master Pointing Retriever and AKC Senior and Master Hunter, Bearpoint’s Dakota. 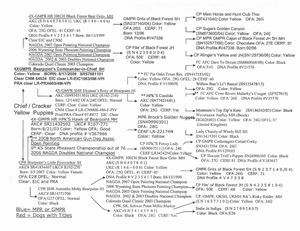 There are 14 dogs currently in the APLA Hall of Fame and 4XGMPR Bearpoint’s Dakota MH’s lineage contains five on his father’s side (4XGMPR Bearpoint’s Commander-in-Chief MH; “Chief”) and five on his mother’s side (CPR Bearpoint’s Little Firecracker JH; “Crackers”). He is a classic lab with great looks, ideal body weight (+/- 70 pounds), solid physique (we are often asked if he is on steroids!!! 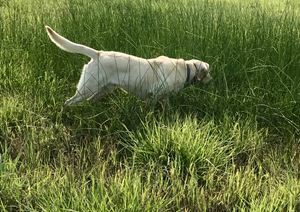 ), an excellent temperament and a desire to please when in the house but turns into a ‘terminator’ when placed in hunting/retrieving situations. He has one speed in the field or on the water but still hunts in a deliberate and organized fashion totally under control. “D” is an intelligent, driven, energetic, no-quit partner in the field (he has been described by his trainer Julie Knutson as her “fire breathing dragon”) with a classic, steady point and an outstanding nose. He trained for and received his APLA 4XGMPR and AKC SH titles all in a time frame of just over five months which, many of us know, is no small feat. He subsequently went on to obtain his AKC MH title the following year and will now move on to HRC competition. 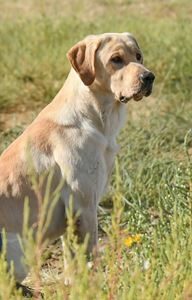 He has all the usual health clearances and brings not only extremely strong upland talents to the table as a strong, staunch natural pointer but is a retrieving machine as well as a talented water dog. Options: Inquiries for breeding with females GMPR or higher is preferred but each breeding will be evaluated based on the quality of the female.